The elevated structure of Interstate 105 passes over Imperial Highway west from Aviation Boulevard by LAX Airport. Photo taken 05/31/15. 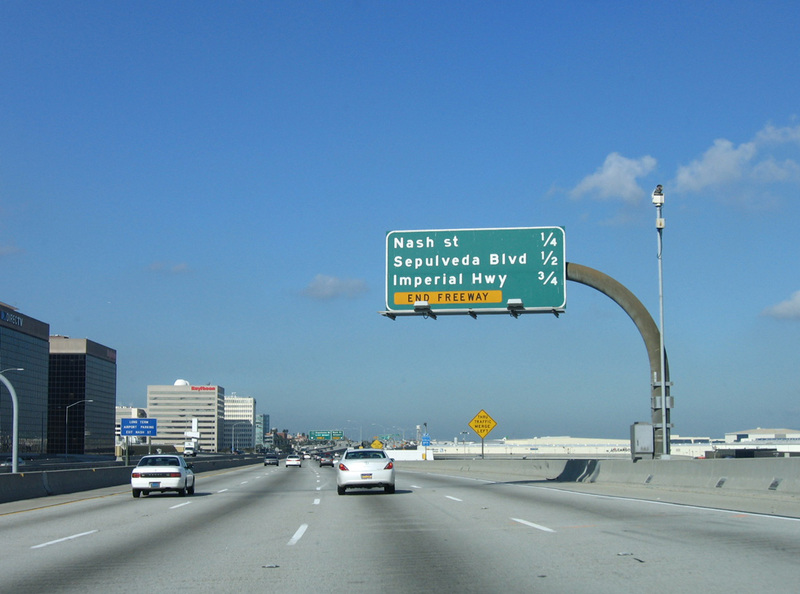 Completed in October 1993, Interstate 105 was the last major freeway to open in the Los Angeles metropolitan area. 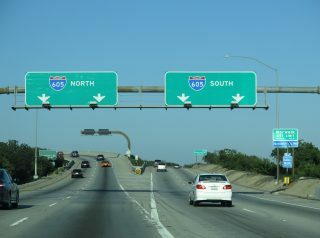 Connecting Los Angeles International Airport (LAX) with Interstate 405 near El Segundo and I-605 in Norwolk, I-105 follows the Glenn Anderson Freeway. 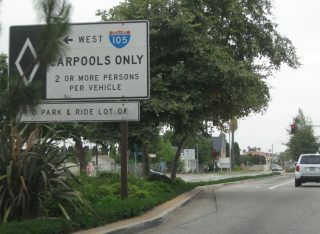 As a multi-modal freeway, Interstate 105 coincides with a segment of Metrolink, which provides rapid transit through South Los Angeles toward LAX Airport. 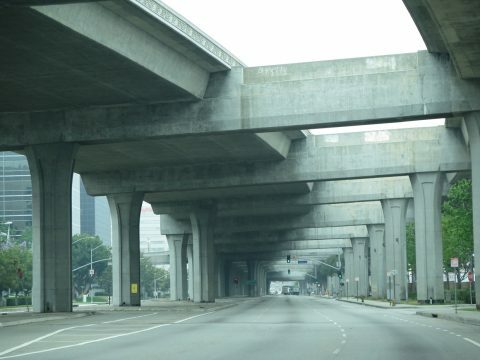 Large train stations are in place at several interchanges, allowing easy access to bus corridors along city streets. 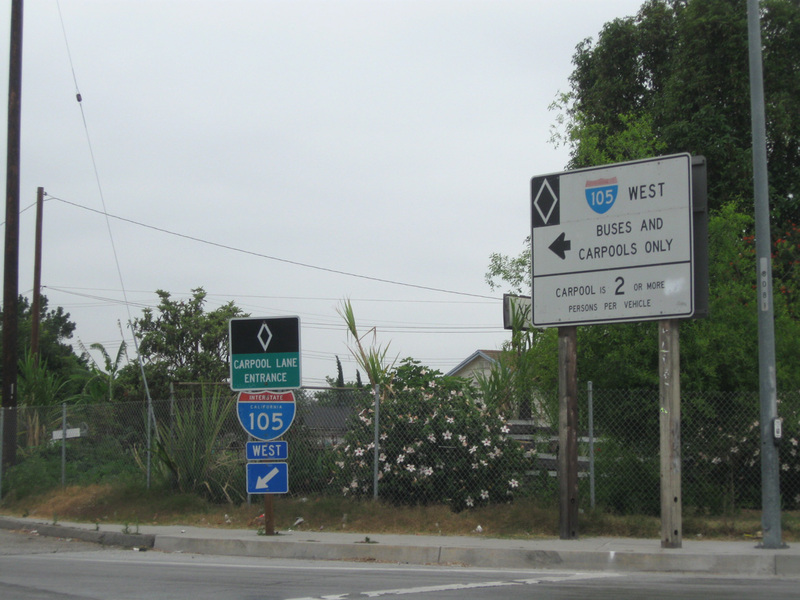 Linking I-5/10, U.S. 101, and California State Route 10 (former I-110) north of Downtown Los Angeles, Interstate 105 was previously commissioned along the Santa Ana Freeway between 1964 and 1968. 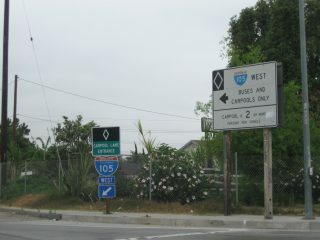 I-105, then I-110 and U.S. 101 converged at an exchange east of the Los Angeles River and Mission Road. 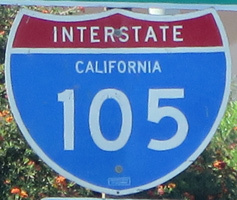 The original Interstate 105 was subsequently decommissioned, and that portion of the Santa Ana Freeway remains as the southernmost extent of U.S. 101. 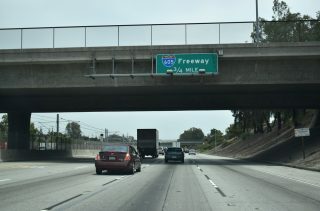 Interstate 105 was revived several years later as the designation for the proposed Century Freeway. A controversial route, protests against the freeway from adjacent community members arose throughout the 1970s and 1980s. 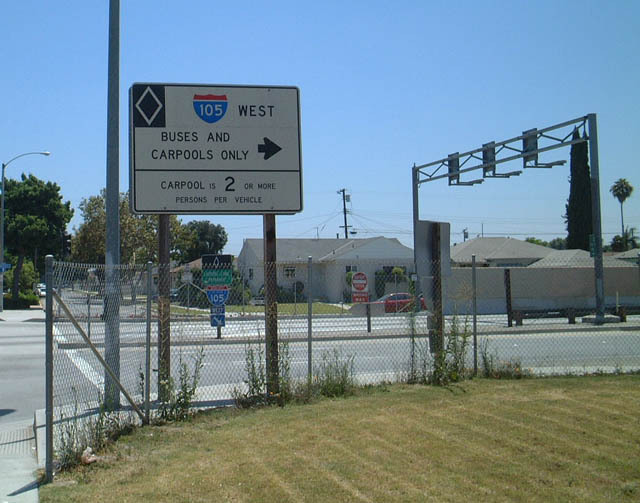 Construction finally commenced on I-105 in 1982. Replacing parallel California 42 (Manchester Avenue), I-105 was originally slated to meet Interstate 5 in Norwalk, but that extension was deleted from plans. 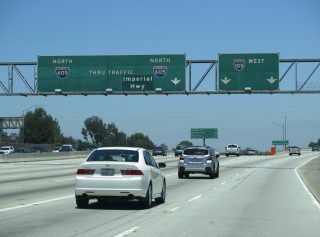 The City of Norwalk considered the freeway to be divisive, and many would argue that the effectiveness of Interstate 105 as a primary east-west freeway was undercut by Norwalk’s action preventing construction within its boundaries. Another early proposal outlined extending Interstate 105 east beyond I-5 to California 90 (Richard M. Nixon Freeway) in Orange County. 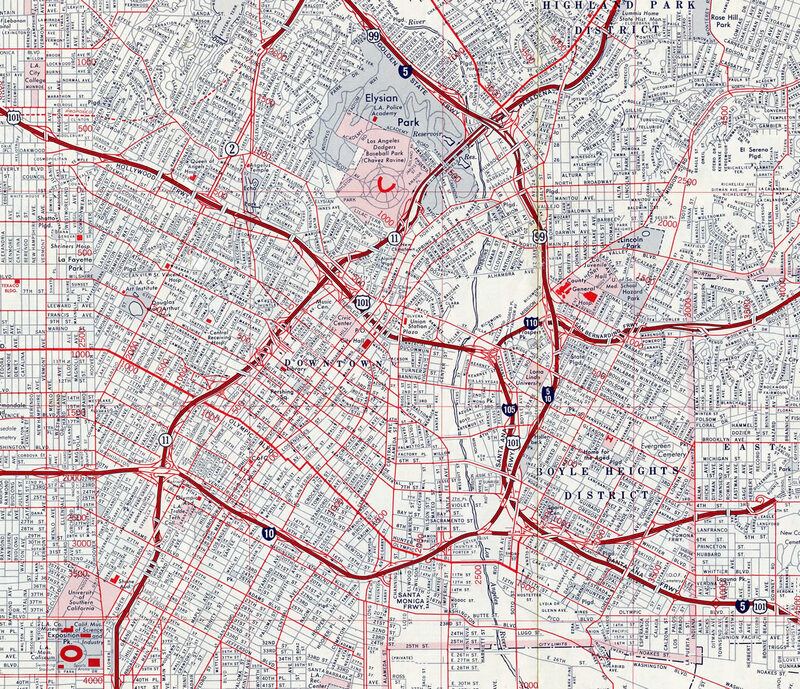 Such a freeway was squashed by public outcry, but the extension remained on the official California state map as a proposed freeway corridor along unconstructed California 90. For more on the Century (Glenn Anderson) Freeway, see Interstate 105 (Daniel Faigin) and In Our Path: Interstate 105 (Jeff Gates). 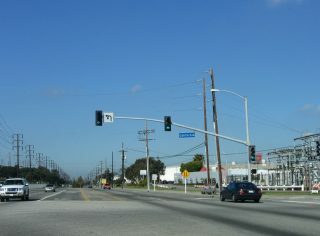 Interstate 105 concludes 1.25 miles beyond the Hanwell Avenue overpass in Downey. Photo taken 07/09/18. 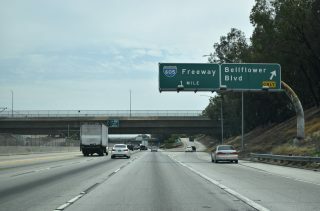 A diamond interchange (Exit 17) joins I-105 (Glenn Anderson Freeway) with Bellflower Boulevard ahead of Interstate 605. Photo taken 07/09/18. 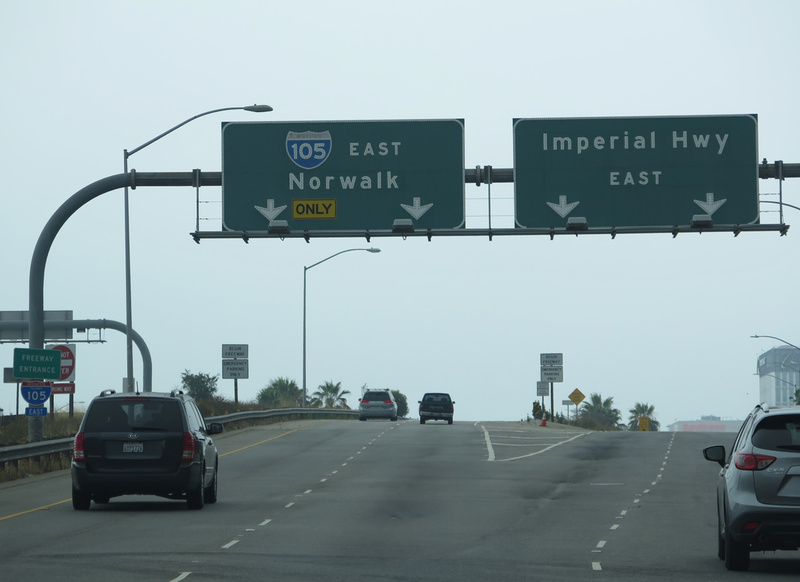 Interstate 105 enters the city of Norwalk at Exit 18 with the San Gabriel River Freeway (I-605). 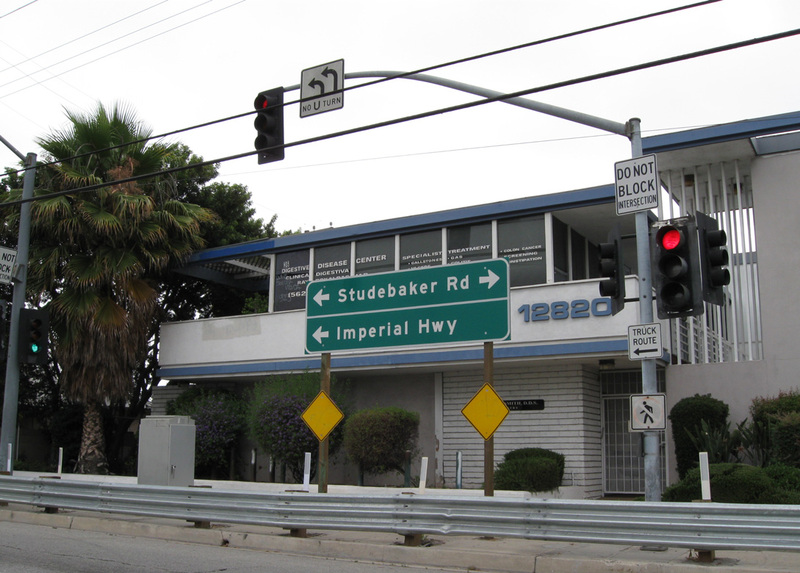 Restricted to HOV-2 motorists, the freeway mainline spurs east to Studebaker Road. Photo taken 07/09/18. 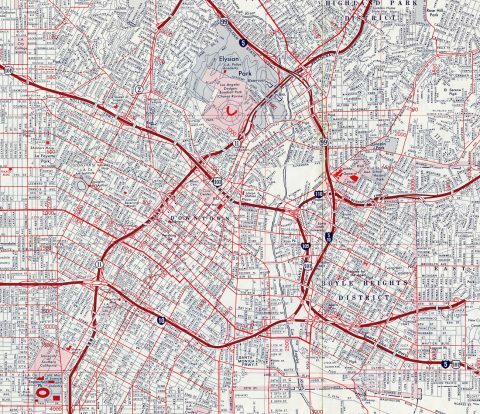 Traffic along Interstate 105 east partitions above the San Gabriel River for I-605 north to Santa Fe Springs and Pico Rivera and I-605 south to Cerritos and Lakewood. Photos taken 07/09/18 and 05/31/15. 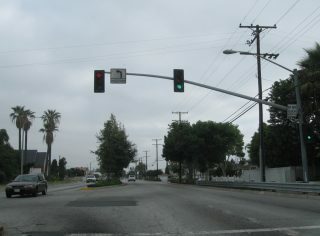 The carpool lanes along I-105 east extend to the traffic light with Studebaker Road just beyond the Norwalk Metro Station. 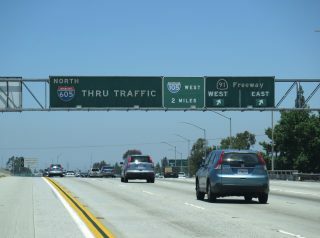 Photo taken 06/19/10. 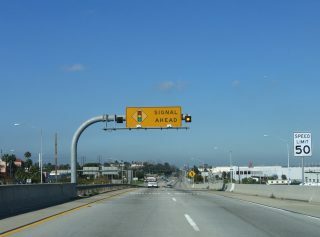 Studebaker Road south at the HOV-2 entrance ramp for Interstate 105 west in Norwalk. 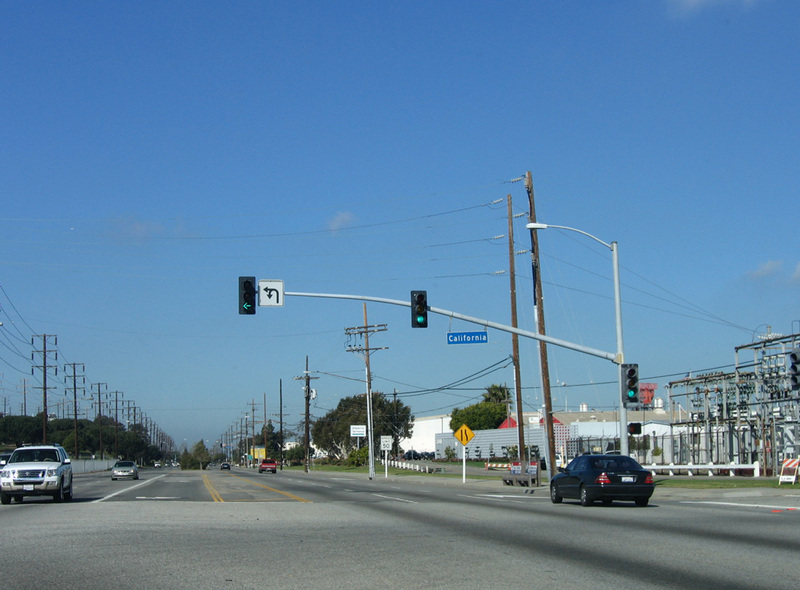 Photo taken 07/21/01. Only high occupancy vehicles (HOV) may use the eastern most 0.75 miles of Interstate 105 between Studebaker Road and I-605. 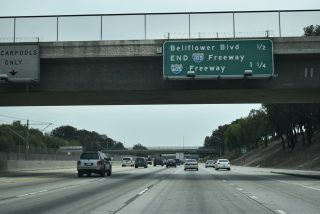 Photos taken 06/19/10. Northbound Interstate 605 at California 91. The Artesia Freeway provides part of the route west from I-5 north to I-105 west in Norwalk. 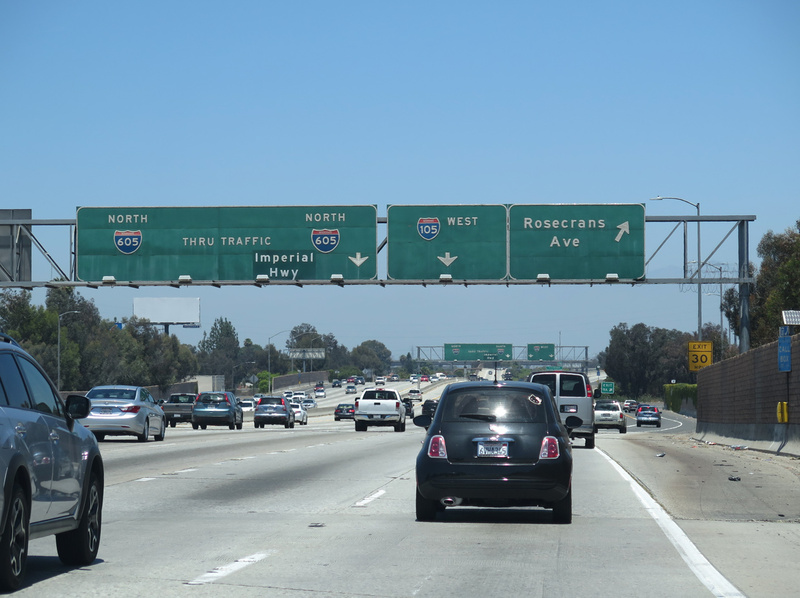 Photo taken 06/20/15. I-605 (San Gabriel River Freeway) crosses into the city of Norwalk at Alondra Boulevard. 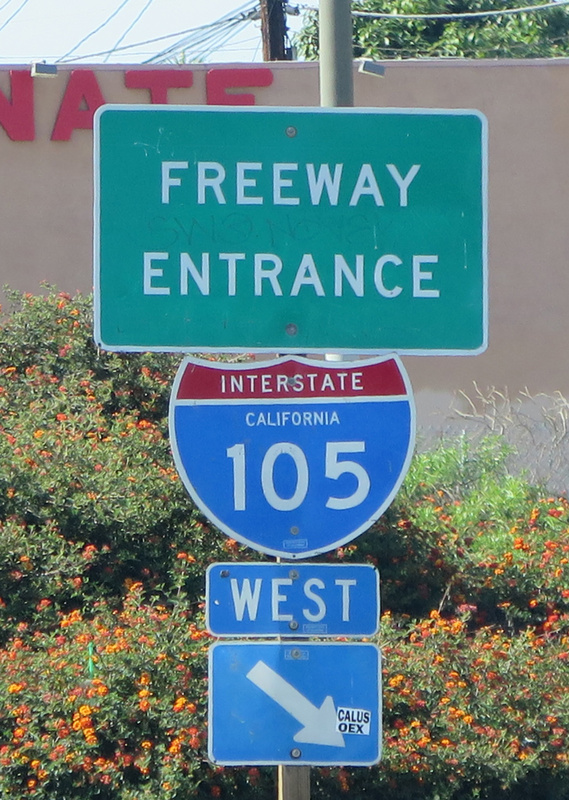 The freeway proceeds north to Rosecrans Avenue and the directional T interchange (Exit 9B) with Interstate 105. Photo taken 06/20/15. 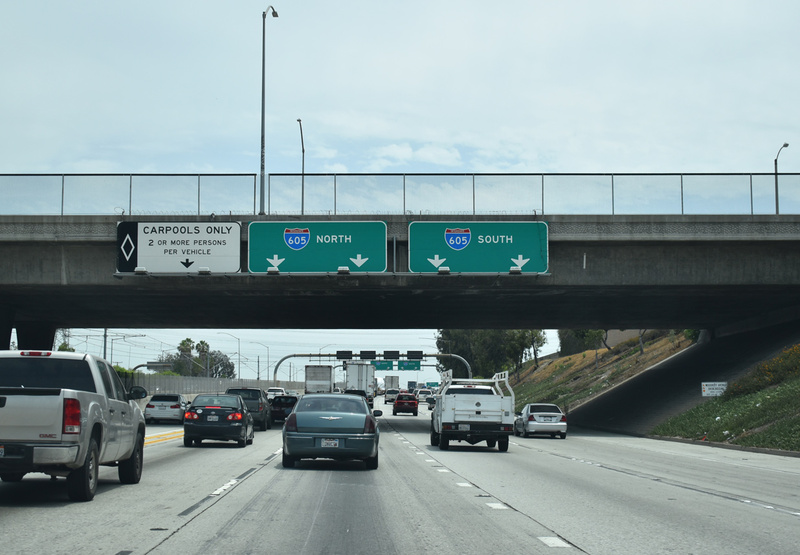 A two lane flyover departs I-605 northbound well ahead of the systems exchange with Interstate 105. Interstate 605 continues north to meet I-5 near the boundary between Norwalk and Downey. 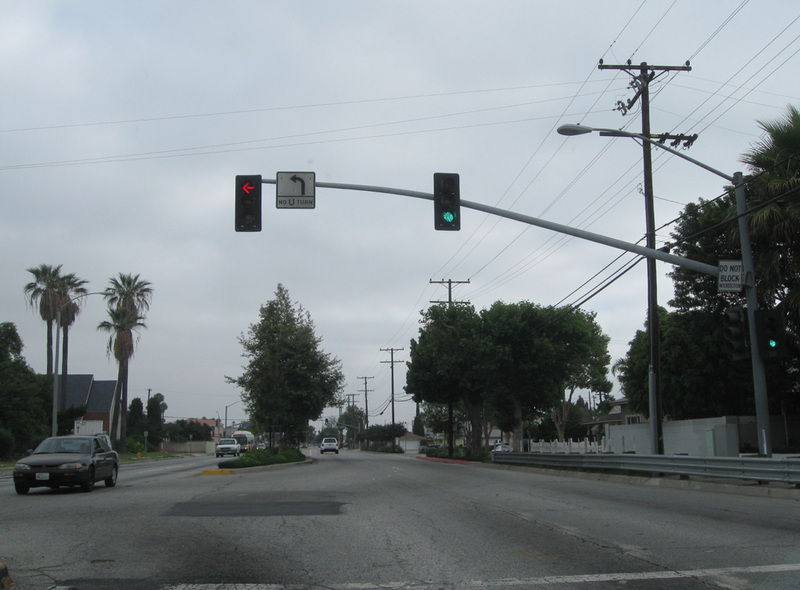 Photo taken 06/20/15. Interstate 105 converges with I-405 (San Diego Freeway) at a systems interchange (Exit 2B) 2.1 miles east of the freeway end at Imperial Highway. Photo taken 03/18/06. The transit corridor that followed the median of I-105 concludes at Los Angeles International Airport (LAX). 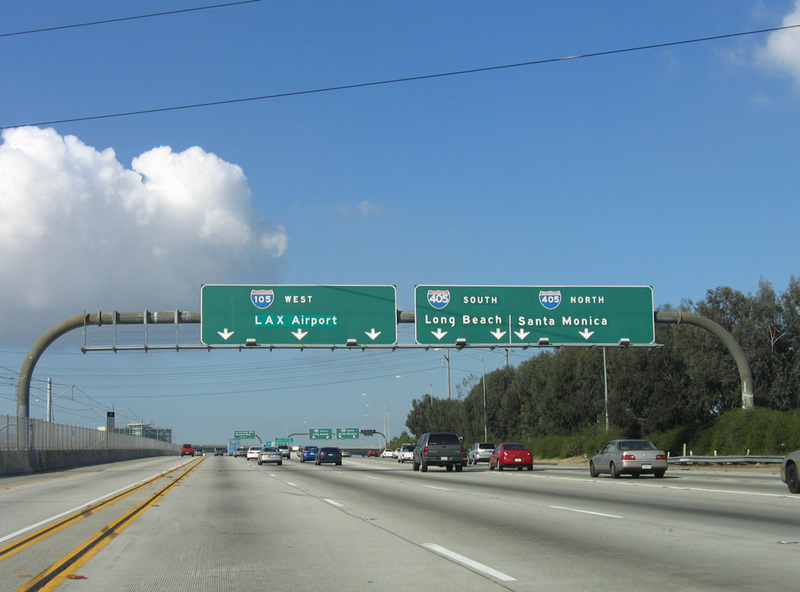 Most traffic remaining Interstate 105 access LAX Airport and its ancillary development or heads toward El Segundo and the beaches near Vista Del Mar. Photo taken 03/18/06. 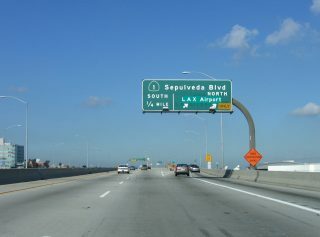 The main exit for Los Angeles International Airport (LAX) is the northbound off-ramp to California 1 (Sepulveda Boulevard). 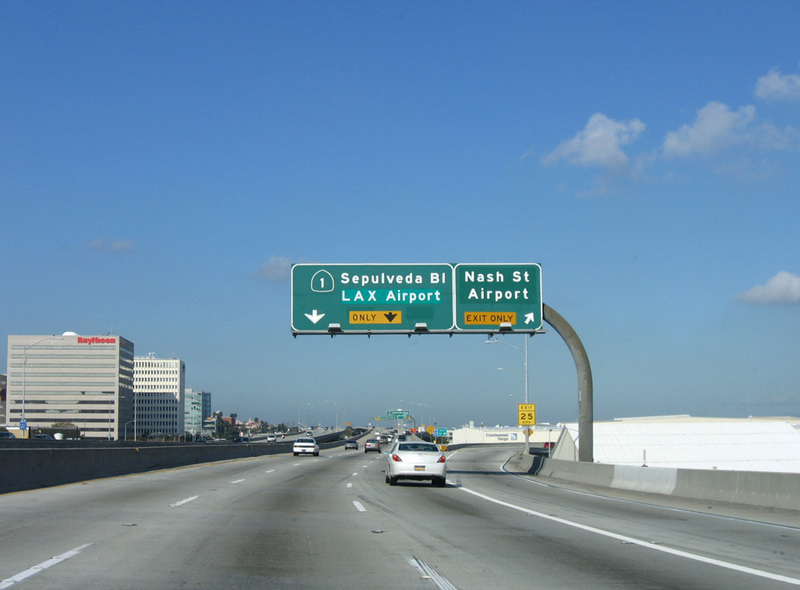 LAX Airport is the busiest airport in Southern California and arguably the U.S. Photo taken 03/18/06. The final exit along westbound Interstate 105 is for SR 1 south, the Pacific Coast Highway, which follows historic Sepulveda Boulevard near LAX Airport. 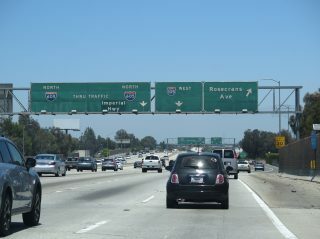 Photo taken 03/18/06. 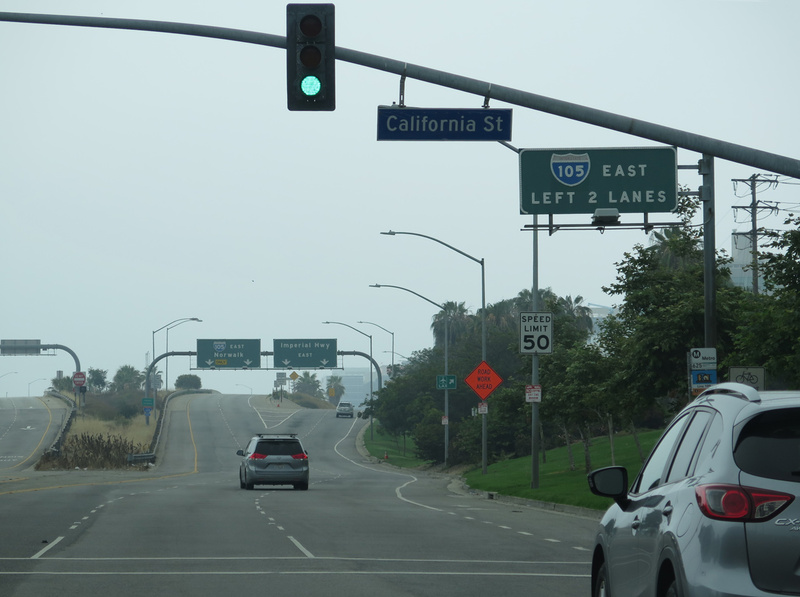 The I-105 westbound viaduct lowers to grade level ahead of the signalized intersection joining Imperial Highway with California Street. 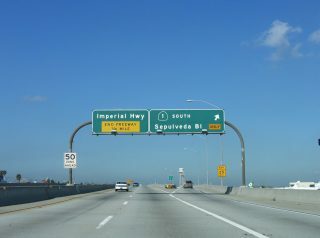 Imperial Highway, a locally maintained arterial, extends 1.75 miles west to Dockweiler State Beach on the Pacific Ocean. Photos taken 03/18/06. Imperial Highway splits with the eastbound beginning of Interstate 105 beyond the intersection with California Street. Photo taken 05/31/15. 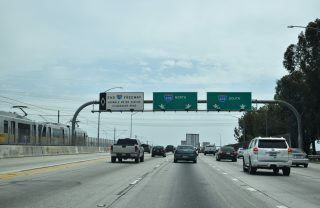 Two lanes ascends onto the I-105 viaduct running along the south side of LAX Airport to Interstate 405 (San Diego Freeway). 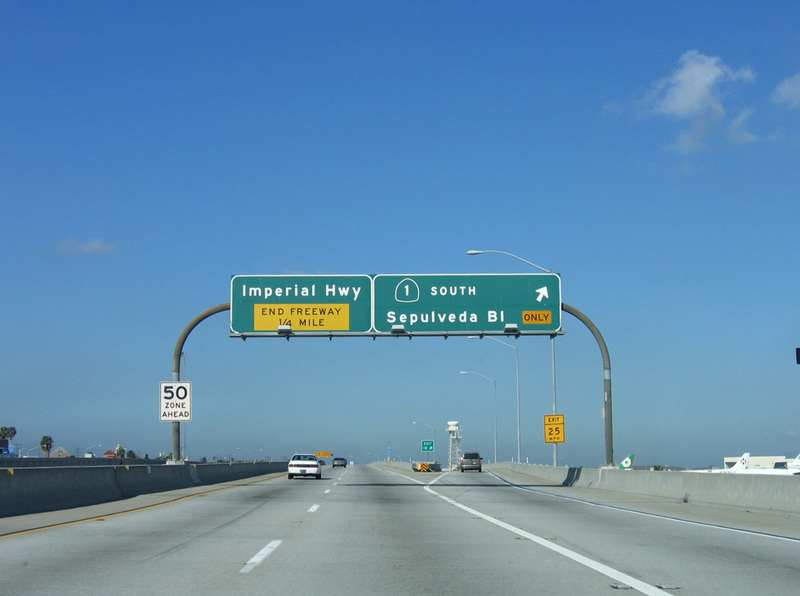 Imperial Highway parallels the elevated roadway east to SR 1 (Pacific Coast Highway) and Aviation Boulevard. Photo taken 05/31/15. “Department of Transportation: Disregarding Early Warnings Has Caused Millions of Dollars to be Spent Correcting Century Freeway Design Flaws.” State of California Publication #99113, August 1999. Page updated March 13, 2019.